When we talk about mindfulness, we usually focus on mindfulness within the individual: an awareness of one’s own thoughts and emotions or staying present in the moment to enjoy one’s own life. What’s missing from the conversation is the mindfulness required to create meaningful connections with others. To have a successful relationship, you can’t be mindful of only your own interior experience; you must be mindful of the other person’s, too. So much of our conflict with loved ones comes from an unawareness of another human being’s inner reality. The phrase buried in so many apologies is “didn’t mean to”: “I didn’t mean to hurt your feelings,” “I didn’t mean to make you angry,” “I didn’t mean to upset you.” The truth would sound more like, “I wasn’t paying any attention to you when I said or did whatever created a problem for you.” Sometimes we may be unaware of a button we’re pushing or a wound we’re picking, but often those slights are not the result of ill intentions, but of having no intentions at all. You probably know that identifying and attending to your emotions is a key to psychological well-being. But you might not know that identifying and attending to the feelings of others is a key to relationship well-being. You can’t grow a loving relationship without regard to the feelings of those for whom you care. Conflict in a relationship arises when you focus your intentions entirely on your needs and ignore or dismiss your partner’s. You might not mean to hurt them, but when your mindfulness practice goes one way, your intentions don’t extend any love or concern to your partner. Having a mindful relationship means deciding whether the connection is important to you and what you want from the other person, and then keeping that in mind when you communicate or are in conflict. If your intention is a loving, romantic partnership, all disagreements should be approached with love and partnership in mind. 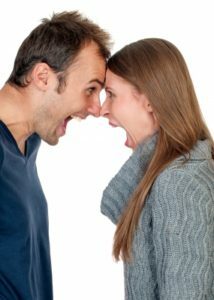 Being mindful of your partner’s needs plays an important role in disagreements. Too often when we are in conflict, even with someone we love, we want only to win. We want the other person to change their behavior without us having to change a thing. We don’t mind a win-lose solution as long as we’re not the loser. Studies show that losses have a more significant psychological impact on us than wins do. Losing is an affront to our sense of self. But this attitude—win at all costs, or at least don’t lose—is toxic to relationships. Does that mean for a partnership to work you have to be okay “losing” an argument sometimes? Not at all. The win-lose scenario isn’t the only way to end a conflict. Try the win-win instead. Winning a fight doesn’t always mean being right. If you get into an argument with your partner because you want to go to a party and they want to stay home and watch movies, one of you isn’t right and the other wrong. Pressuring your now-resentful partner into going to the party might feel like a win, but is it? A real win, the kind that lasts past one fight and makes your relationship stronger, is one in which your partner hears your point of view and addresses your needs or desires, and you do the same for them. Respect:Respect is the basis of an emotionally healthy relationship. Respect your partner’s boundaries if you expect them to respect yours—and they should. Time and attention:One of the most powerful ways to show your partner you love them is by giving them undivided time and attention. Affection:Not only is physical affection an essential part of intimate relationships because it makes your brain release oxytocin, the “love hormone,” but studies show a link between affection deprivation and physical pain and poor sleep, which in turn increases negative emotions. Approval:As a child, you seek approval from your caregivers and teachers; as an adult, you seek it from your loved ones. Simple compliments are easy to give and go far in building closeness and positive regard. Security, predictability, and consistency:We all want a warm bed to come home to at the end of the day, a secure base we can retreat to. Your closest relationships should provide this base of support for you. In turn, you need to be there reliably for the people you love. Autonomy and control:No matter how close you are to your partner, for the sake of your mental health and sense of self, you both need to maintain a separate identity. Your partner may sometimes have a priority that takes precedence over you, and that’s okay. To create and maintain a loving relationship, decrease the frequency of conflict, and solve the conflicts that arise in a way that’s worthy of your partnership, you must be mindful of your partner’s needs and desires. For love to last, empathy must be a two-way street. No one can lose if everybody wins, and everybody wins when both of your needs and desires are treated with respect and validity. If you are experiencing relationship issues and are wanting to know more about mindfulness, contact me for coaching in Portland. This entry was posted in coaching, Relationships on September 5, 2018 by FireSpike.